Well, hasn't started yet, but stay tuned! - Kate Winslet, at 31, 5 Oscar Nominations so far? Damn, good for her! - all those guys in front of the white background right now. Apple commercial? Funny though, Eddie Murphy's serious face cracked me up. Hal Hickel was in it!! - was that Jack Nicholson without hair? - it's always funny when they film some people laughing at a joke, but then they keep filming and you can see that they force themselves to keep laughing. Classic! - "No one can fill a seat like an American!" - "... we just don't have time for boring speeches." HAHAHA! - Art Direction Winner: Pan's Labyrinth!!!!!!!!!!!!! YEAH!!!!!!!!!!!! Nicole Kidman said: "And the Winner is..." I thought you have to say: "And the Oscar goes to..." because it's more politically correct, non? - Will Ferrel, what hair! Funny Song too! - Make-up Winner: Pan's Labyrinth!!!!!!!! OH YEAH AGAIN!!!!!!! - Speech is up, get off the stage. Annoying as always when they cut you off. - Best Animated Short Winner: The Danish Poet!!! Well deserved!! - so Nicholson really did shave his head, interesting, what movie is that for? - Aawww, talking to Mark Wahlberg right after he lost... not funny. - Dance group... booooring, time for a break. - those songs are not doing it for me. - Oscar has gone green. And boring. - I still can't stand Cameron Diaz. But the dress is nice. - Best Animated Feature: Happy Feet. I knew it. It's about penguins, Cars was not succesful enough, Monster House even less. Lame. Monster House was my top pick. And yes, it's mocap, get over it. - Montage about writers. I always like it when you can see similar moments/scenes from different movies. - what was that before? 3 Suprises? Best feature, best animated short and another one. Those were not really surprises though (except the 3rd one, which I can't remember). It's really cool that the Danish Poet won, great short! - I still like Tom Cruise, no matter what stupid gossip stuff is going on. He's an underrated actor. - Cancer Research. Montage. Cruise hands out Oscar. I set the show on mute, so I don't know who it is. - walk through of Ellen again. Not really funny, until myspace came up. Correcting Spielberg, awesome! - Cedit Card commercial: PayPass? Tap and go? No code, no signature? Any security??? - And here we go: Best Visual Effects: Pirates of the Carribean 2!!!!!!!!!!!!!!!!!!!!!!!! - Let's cut people off, film Beyonce because it's boring VFX, classic! - Best Foreign Language Film: The Lives of Others. WOW! NOT PAN'S LABYRINTH??? - Cool Snakes on a Plane Shadow thing!!! - Best Supporting Actress: Jennifer Hudson. Good for her!! Take it Beyonce! - Nice acting by Celine Dion... Oh please. - Ennio's speech. Beautiful language. Clint's translation was a bit casual, same goes for his delivery. Took away from the emotional impact. - Babel's score, hold on. During the nomation montage, that guitar piece? That's from The Insider and the TV show Deadwood! Huh? - Jennifer Hudson! Holy Moly! It's a miracle that her... assets... didn't fall out of her dress! But boy, what a voice! - Best Actor: Forest Whitaker. Nice. 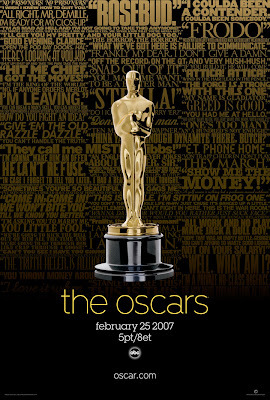 - why is Scorsese not up there during the best movie oscar?? That's it folks! Long night as usual. Yep. But Happy Feet was just more popular, another big reason why it won.